This past Wednesday we had the absolute pleasure of co-hosting a Friendsgiving DIY Workshop at Urban Outfitters with the lovely ladies of The Everyday Co. and True Vine Studios. Today, we want to share some of the styling tips, floral ideas, and gratitude activities we discussed at the event. For our table settings we started with the dishes. We showcased a modern look (c/o Urban Outfitters), a natural look (c/o Shanmanclayco), and a more traditional look (c/o Sage Market + Design). Each setting was completed with Everyday Napkins, floral arrangements, and a gratitude based place card. Kathryn of The Everyday Co. reminded us to think sustainably when setting our Thanksgiving table this year. Everyday Napkins are a great alternative to paper napkins/paper towels and add a soft, warm, and comforting texture to any table setting. Kaylyn of True Vine Studios recommended that we think of floral arrangements that work best for our table. Are you doing family style? Go with garlands, bud vases, or potted plants to conserve space. Having a more traditional dinner? Go for an arrangement or two, so the table doesn't feel too sparse. At the beginning of the evening have everyone write down one thing that they are grateful for and place it in a bowl or jar. en during the middle of dinner or at the end of the night, each guest will randomly pull a note from the jar to read aloud anonymously. Close the night with gratitude note writing, host (or a nominated person) will be responsible for sending out the notecards at a later date (2,4,6 months later) as a reminder of what there is to be thankful for. Get 30% off Thank You Notes in our shop using code GRATITUDE2016. Offer expires 11/28/2016 at 11:59pm. 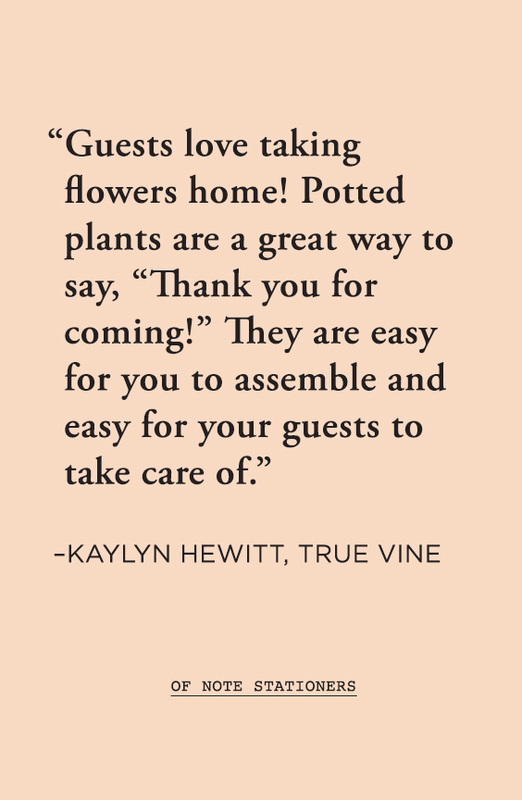 Guests love taking flowers home! Potted plants are a great way to say, “Thank you for coming!”They are easy for you to assemble and easy for your guests to take care of. Get creative and wrap small gifts, baked goods, and favors with The Everyday Co's Dinner Napkins or Hand Towels. Download our Recipe Card to share your recipe with the host! We were so excited to see one of our guests put these tips to use the next day at West Elm! For those of you who couldn't attend, we have shared our Friendsgiving Tips handout, Recipe Cards, and Place Cards as free downloads for you to use this Thanksgiving. Enjoy!